The VWR Solid Door 4°C Lab Refrigerator SLV-23 provides users with a high performance, digitally controlled environment for scientific and medical applications. This lab refrigerator has an adjustable temperature range from 1 to 10°C (33.8 to 50°F) that can be set from the digital control panel with microprocessor power, and continuous monitoring. 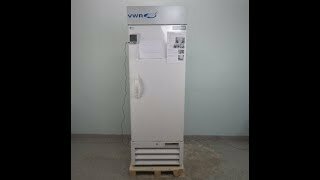 The VWR laboratory refrigerator keeps samples secure with real time sample simulated temperature monitoring, remote alarm dry contacts, high and low temperature alarms that are both audible and visual. This 23-cu ft 4C Refrigerator features oversized evaporators and condensers, with forced air circulation for a uniform chamber temperature and quick recovery after openings. To prevent the loss of product from temperature spikes, this lab refrigerator features an automatic cycle defrost. This VWR SLV-23 Solid Door 4°C Lab Refrigerator is a Brand New Scratch & Dent Model tested by our service team with clean bill of health, as part of our QC testing process. All of our lab equipment comes backed with our standard warranty. Should you have any questions about this or any of our other lab freezers, please don't hesitate to contact us.